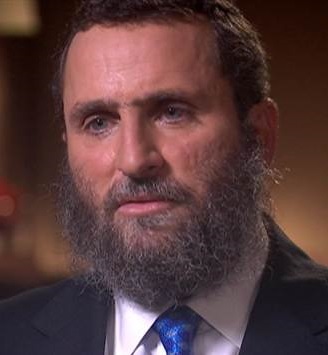 Shmuley Boteach is a “celebrity rabbi” and former “spiritual advisor” to the late pop star Michael Jackson who has been an outspoken supporter of Donald Trump. Known for his controversial “pro-Israel” advocacy, Boteach is the author of sensationalist books like Kosher Sexand Kosher Lust: Love is Not the Answer. Boteach is also the founder of The World Values Network, a group that is “based on the teachings of Rabbi Shmuley Boteach and his passion for bringing universal Jewish values to mainstream American culture and beyond.”The group is financed by billionaire casino mogul and “pro-Israel” ideologue Sheldon Adelson,who once “pledged $1 million” to the World Values Network during a gala eventand claimed that Boteach is “one of the smartest guys I’ve met.”Boteach also received a $500,000 Super PAC donation from Adelson during his unsuccessful 2012 campaign for the U.S. House of Representatives in New Jersey’s ninth congressional district. An ally of Sen. Ted Cruz, whom Boteach calls “a phenomenal friend of Israel,”Boteach has also been a staunch defender of the Trump administration, particularly against charges of anti-Semitism. 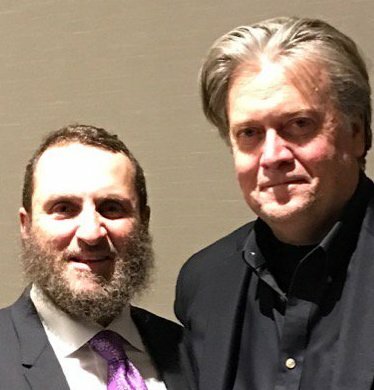 Shortly after Trump’s election, Boteach tweeted a photo of himself and Trump adviser Steven Bannon, the controversial former head of the alt-right news service Breitbart. He wrote: “Steve Bannon has shown great support for Israel & this administration promises to be very strong for the Jewish state.”After the sharp increase in anti-Semitic incidents early in the Trump presidency, Biotech admitted that Trump “was late to condemn the rising tide of antisemitism in America” but bizarrely countered that “President Obama never once criticized Iran’s threats of annihilation against the Jewish people. This was not the first time Boteach had attacked leading Jewish figures. In November 2015, Boteach took out an ad in the New York Timesthat a former head of both the American Jewish Congress and the Synagogue Council of America said “could only have drawn its inspiration from the PR skills perfected by Hitler’s propaganda chief.” The ad targeted comments Secretary of State John Kerry made about the negative effects of Israeli settlement expansion in the Occupied Palestinian territories. It claimed that Kerry “appears to justify the spilling of Jewish blood” and accused the Secretary of States of echoing “virulent anti-Semitic libel” in stating that the continued expansion of Israeli settlements in the Occupied Palestinian territories could turn Israel into an apartheid state. During the Obama presidency, Boteach’s World Values Network attacked the administration in controversial full-page ads in the New York Times. One such ad, which ran in the Times in February 2015, attacked President Obama’s National Security Adviser Susan Rice over her comments that Israeli Prime Minister Benjamin Netanyahu’s decision to give a speech to Congress lambasting the Iran nuclear negotiations without having first consulted the White House was “destructive” to the U.S.-Israeli relationship. More recently, during a January 2016 interview with the Jewish Chronicle Online, Boteach bemoaned that liberal students today prefer “death cults” like Hamas and “barbarous” regimes like the government in Iran.” “The world has gone mad,” he told his interviewer. David Weigel, “The Kosher Candidate,” Slate, August 21, 2012, http://www.slate.com/articles/news_and_politics/politics/2012/08/rabbi_shmuley_boteach_is_banking_on_sheldon_adelson_s_super_pac_to_help_him_become_a_new_jersey_congressman_.html. The World Values Network, “About,” https://worldvalues.us/about/. Henry Siegman, “Violence, Moral Equivalence, and the End of a Two-State Solution in Israel-Palestine,” The Nation, November 24, 2015, http://www.thenation.com/article/violence-moral-equivalence-and-the-end-of-a-two-state-solution-in-israel-palestine/. Katie Zezima, “How much does lunch with Sheldon Adelson cost?” The Washington Post, May 29, 2015, https://www.washingtonpost.com/news/post-politics/wp/2015/05/29/how-much-does-lunch-with-sheldon-adelson-cost/. Betsy Woodruff, “Ted Cruz’s Favorite Rabbi,” The Daily Beast, November 29, 2015,http://www.thedailybeast.com/articles/2015/11/29/ted-cruz-s-favorite-rabbi.html. Jerusalem Post, “Jewish groups line up to denounce Boteach ad on Susan Rice,” March 1, 2015, http://www.jpost.com/Diaspora/Jewish-groups-line-up-to-denounce-Boteach-ad-on-Susan-Rice-392519. Jill Jacobs, “Shmuley Boteach isn’t ‘America’s rabbi,’” The Washington Post, March 4, 2015, https://www.washingtonpost.com/posteverything/wp/2015/03/04/shmuley-boteach-isnt-americas-rabbi/. Shmuley Boteach, “A Spiritual Night in Hebron,” The Huffington Post, September 29, 2015, http://www.huffingtonpost.com/rabbi-shmuley-boteach/a-spiritual-night-in-hebr_b_744577.html. Shmuley Boteach, “Obama’s Bullying of Israel,” The Huffington Post, May 25, 2011, http://www.huffingtonpost.com/rabbi-shmuley-boteach/obamas-bullying-of-israel_b_504291.html. Shmuley Boteach, “Obama Compares Iran-Deal Opponents to the Mullahs,” The Huffington Post, August 12, 2015, http://www.huffingtonpost.com/rabbi-shmuley-boteach/obama-compares-irandeal-o_b_7977136.html. Naomi Firsht, “It’s very hard to be a proud Jew here,” Jewish Chronicle Online, January 4, 2016, http://www.thejc.com/lifestyle/lifestyle-features/151852/it’s-very-hard-be-a-proud-jew-here. David Weigel, “The Kosher Candidate,” Slate, August 21, 2012,http://www.slate.com/articles/news_and_politics/politics/2012/08/rabbi_shmuley_boteach_is_banking_on_sheldon_adelson_s_super_pac_to_help_him_become_a_new_jersey_congressman_.html. Katie Zezima, “How much does lunch with Sheldon Adelson cost?” The Washington Post, May 29, 2015,https://www.washingtonpost.com/news/post-politics/wp/2015/05/29/how-much-does-lunch-with-sheldon-adelson-cost/. Adam Dickter, “Pascrell Defeats Shmuley Boteach in Northern NJ Race,” The Jewish Week, November 5, 2012,http://www.thejewishweek.com/news/breaking-news/pascrell-defeats-shmuley-boteach-northern-nj-race. Jerusalem Post, “Jewish groups line up to denounce Boteach ad on Susan Rice,” March 1, 2015,http://www.jpost.com/Diaspora/Jewish-groups-line-up-to-denounce-Boteach-ad-on-Susan-Rice-392519. Jill Jacobs, “Shmuley Boteach isn’t ‘America’s rabbi,’” The Washington Post, March 4, 2015,https://www.washingtonpost.com/posteverything/wp/2015/03/04/shmuley-boteach-isnt-americas-rabbi/. Shmuley Boteach, “Obama Compares Iran-Deal Opponents to the Mullahs,” The Huffington Post, August 12, 2015,http://www.huffingtonpost.com/rabbi-shmuley-boteach/obama-compares-irandeal-o_b_7977136.html. Naomi Firsht, “It’s very hard to be a proud Jew here,” Jewish Chronicle Online, January 4, 2016,http://www.thejc.com/lifestyle/lifestyle-features/151852/it’s-very-hard-be-a-proud-jew-here.